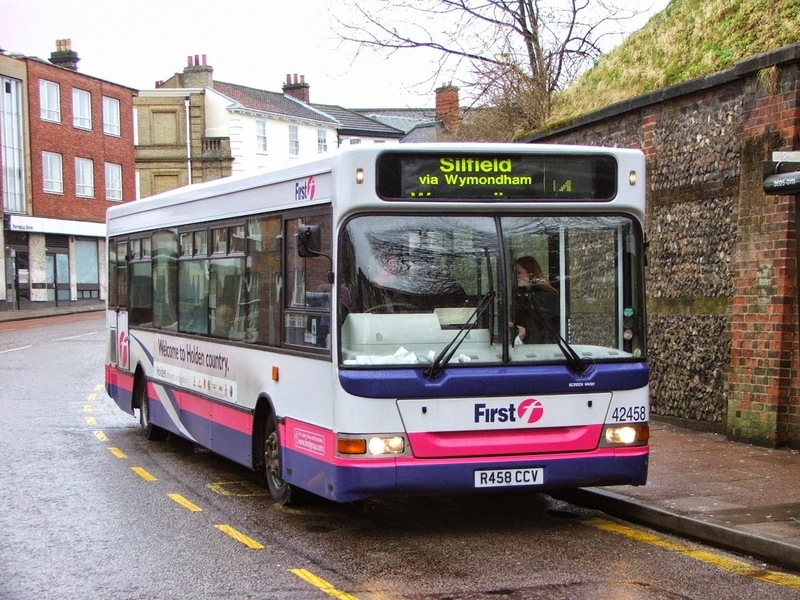 A well earned day off from work meant I could give the camera a work out so i decided to visit the all change town of Ipswich to update my collection with all the recent activity of both First and Ipswich Buses. boarded the 08.30 service from Norwich bound for Suffolk's county town. I arrived around 9.15 and then made my way to the Old Cattle Market area as the sun is spot on for photos for most of the morning, most services run past here, some going into the Bus station others stop adjacent to it. Within a few minutes, My good friend Jim Long appeared to greet me (our Suffolk reporter!) and I also met David Warren for the first time, an excellent photographer and well worth having a look at his Flickr gallery. 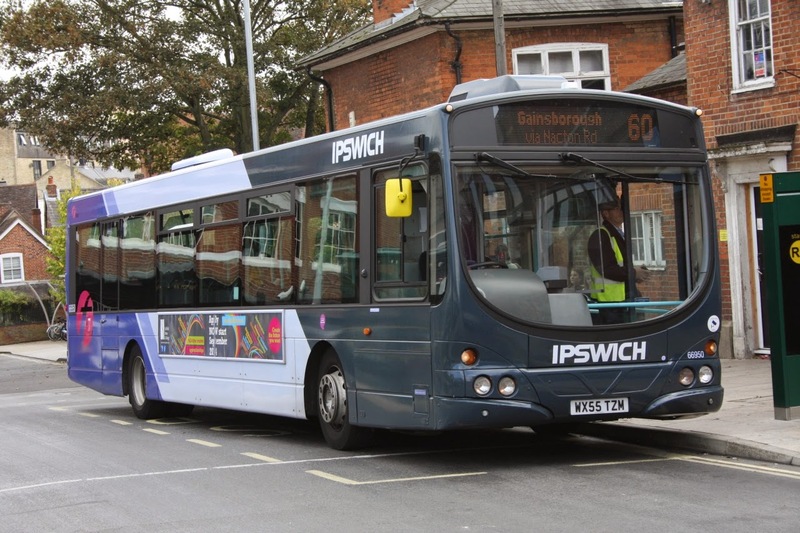 The First Ipswich repaints are gathering pace and plenty of the fleet now wear the new "Air Force Blue" fronts or whatever else it has noted as! 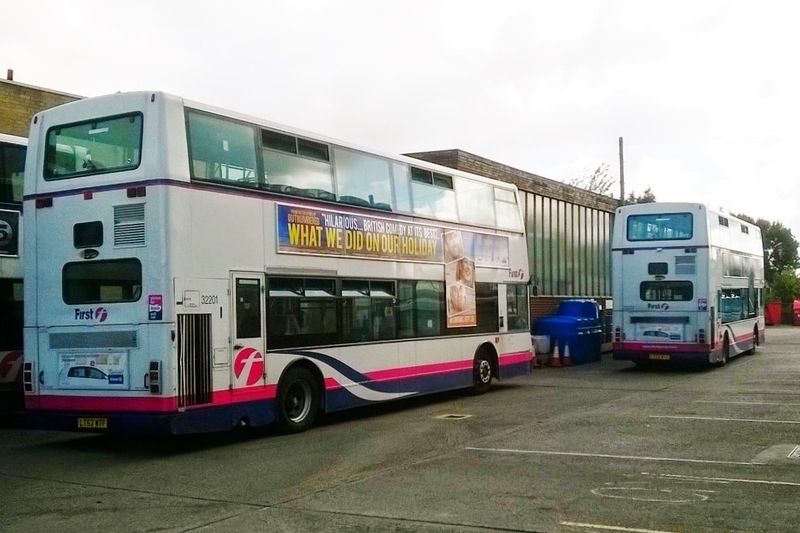 Ex Yarmouth Volvo B7RLE's 66950 & 66957 both carry the new colours.Yarmouth's 30888 remains here on loan also and was noted today on the 66. Ipswich Buses fleet has become very colourful since my last visit with two versions of a new livery in use, the main livery is Green, Purple and White with a few vehicles in the same style but the Purple is replaced with Sky Blue as you can see from the photo of Enviro200 YX63KGE which was operating the 800 Park & Ride service alongside the ex Nottingham Optare Versas. 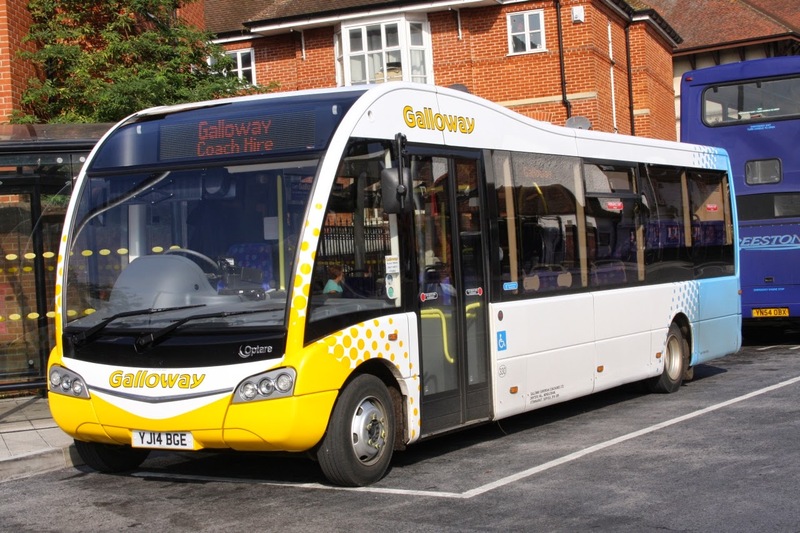 Plenty of smaller operators also run into Ipswich including Galloway of Mendlesham who were using Optare Solo's including YJ14BGE which is an SR version with the newer style front. 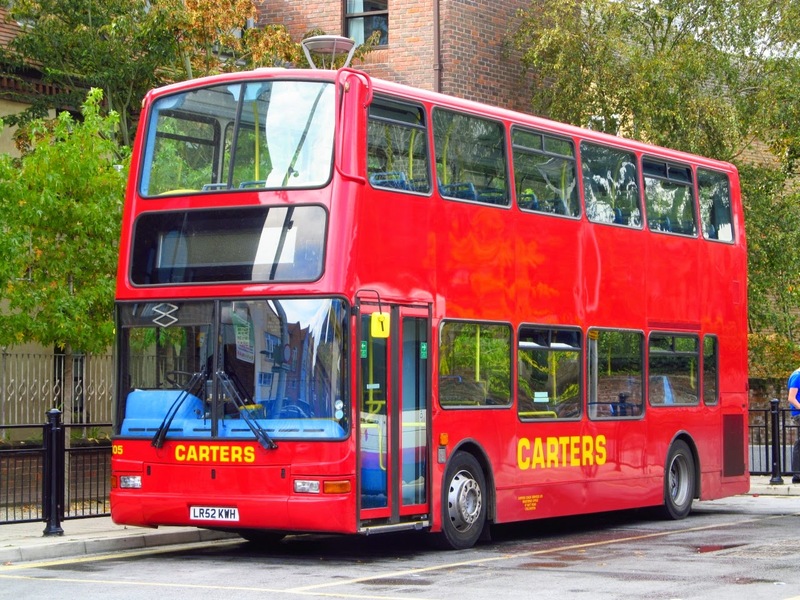 Carters operate services serving Colchester and Manningtree and recent arrival Trident LR52KWH was noted at the bus station awaiting her next duty. Observing the operations today it did strike me that both First and IB are trying to improve both vehicles and customer services in a very competitive market and I have to say all vehicles were well presented in their new liveries, still plenty of vehicles to be refurbished I know but impressed with the results so far! 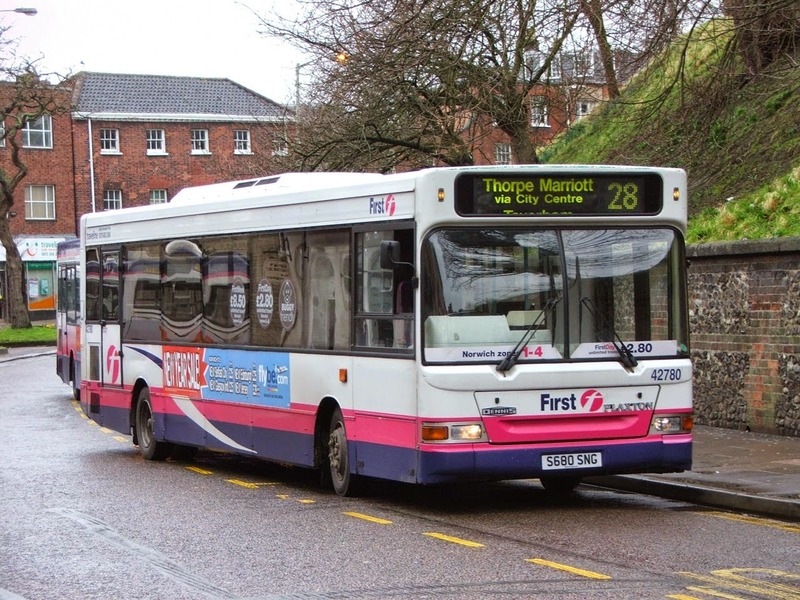 The Dennis Dart is slowly becoming a vehicle of the past, so in its honour we go back to 2005 and a trip to a damp wintery February in Norwich. 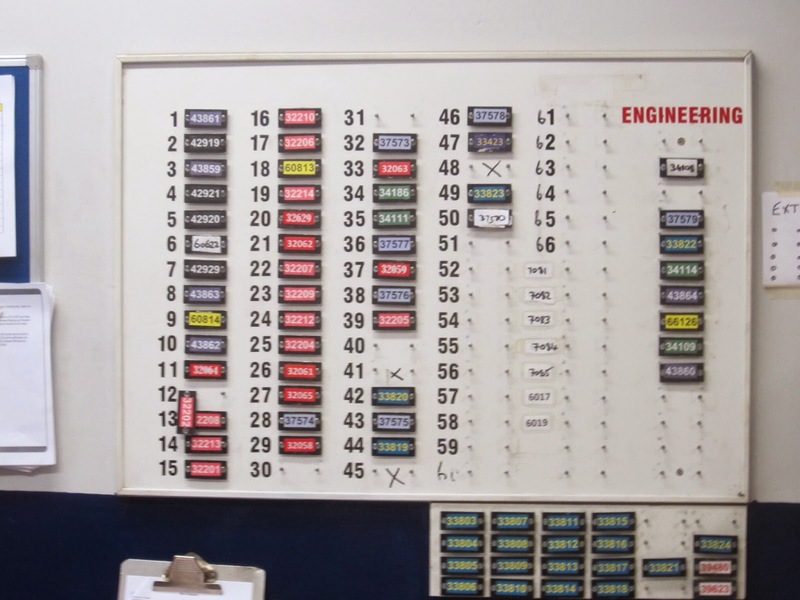 Our Photo special looks at the Pointer versions that ran in the city that year. Next up is 42458 R458CCV pictured at Castle Meadow, taken shortly after transferring from First Devon & Cornwall, she also had spells at Great Yarmouth and Lowestoft before moving to Essex. before transferring to First operations in the South West. 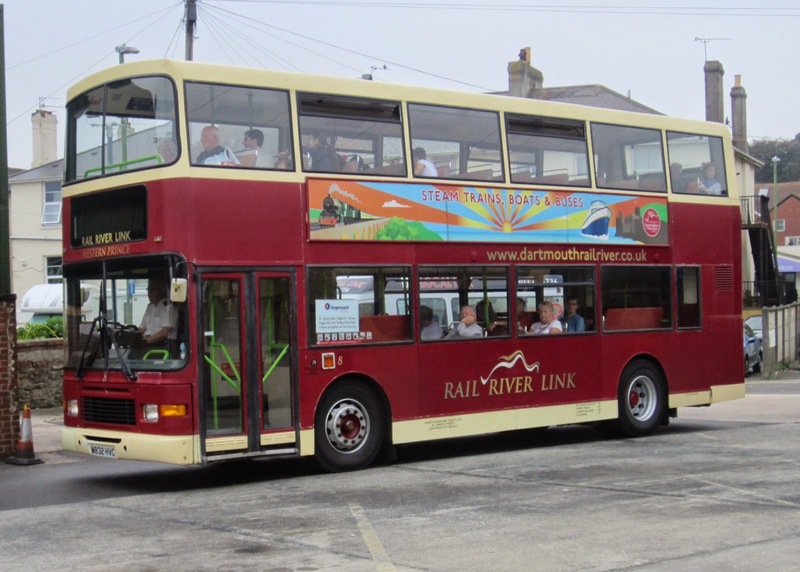 Only two Darts remain in use with Eastern Counties, both operate from Lowestoft Depot,43466 (R466CAH) & 43481 (R481DPW). Both are expected to be withdrawn in November this year. 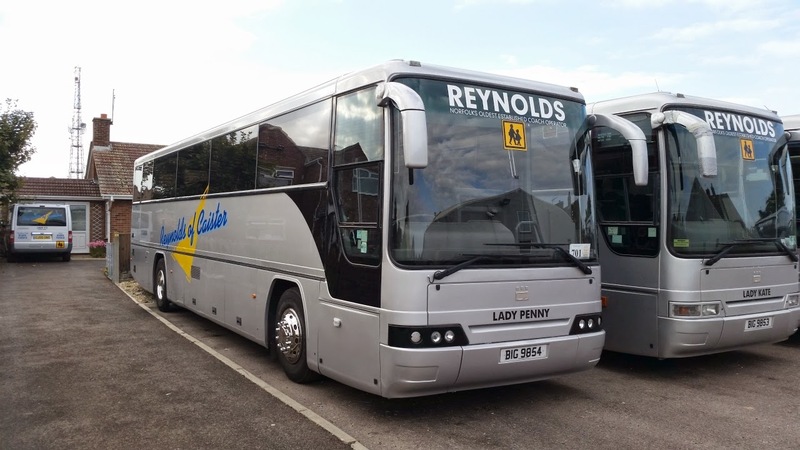 Reynolds fleet update is continuing with BIG9854 Lady Penny being treated to a make-over, she now has new front and rear light clusters as well as the black swoop incorporated in the livery similar to the recent Plaxton Profile arrivals here. 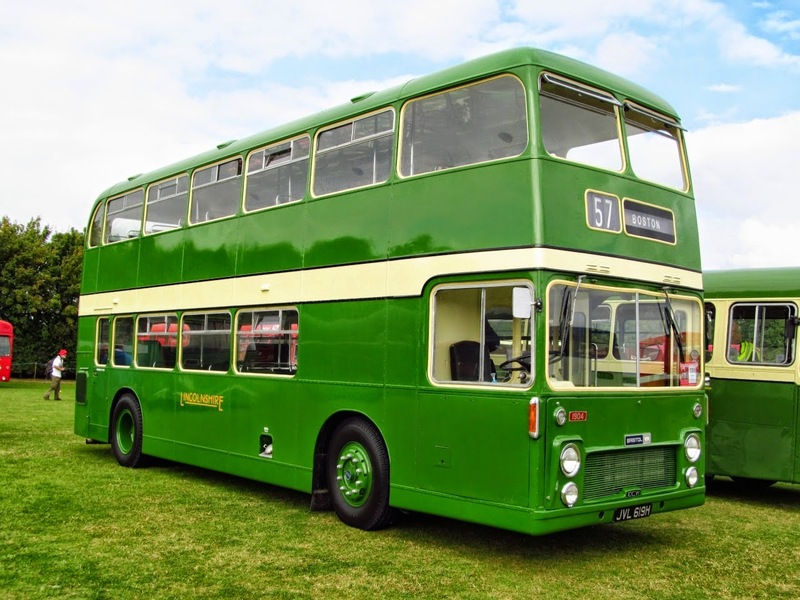 The annual Showbus event at Duxford took place last Sunday and unlike most blogs we are a bit late in posting a review due to work and other duties along the way! 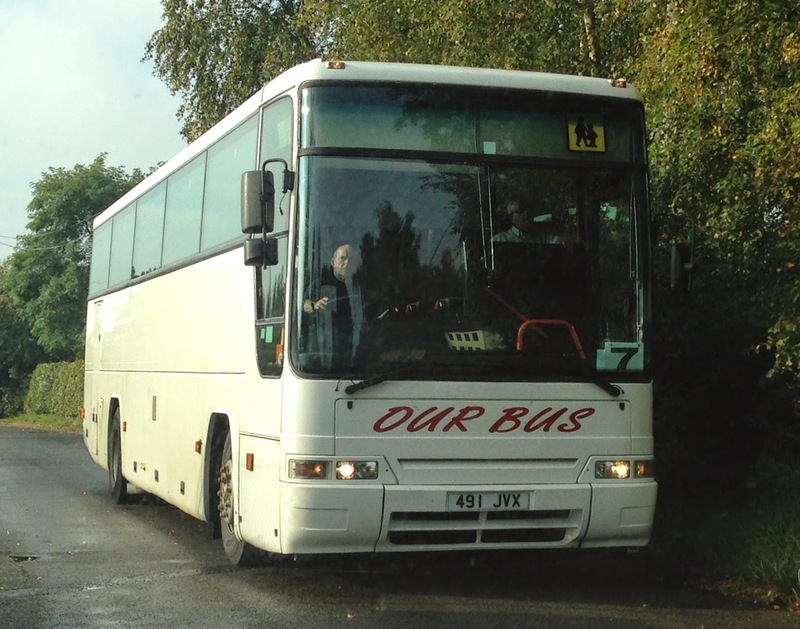 we were joined for the trip by Clive Nixon who runs the Ipswich Bus Blog. First thing to report was no rain, the odd black cloud did appear but thankfully no wet stuff!. 33423,36180, 32479 and freshly refurbished B7RLE 66957 from Ipswich. project really shows what can be achieved. 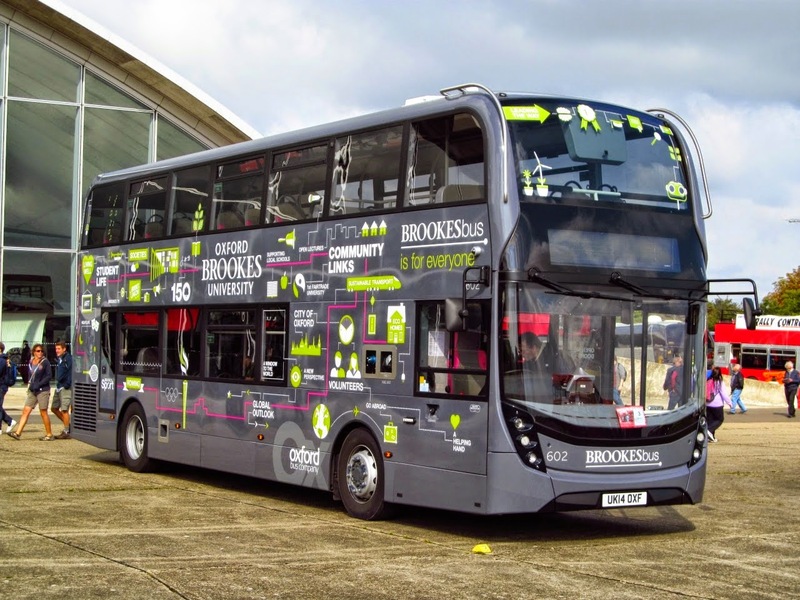 Alexander Dennis new Enviro 400 Gyrodrive Mechanical Hybrid vehicles UK14OXF which operates for Brookesbus, it is one of 14 used for services at Oxford Brookes University. to WFM! It is now owned by Julian Patterson. 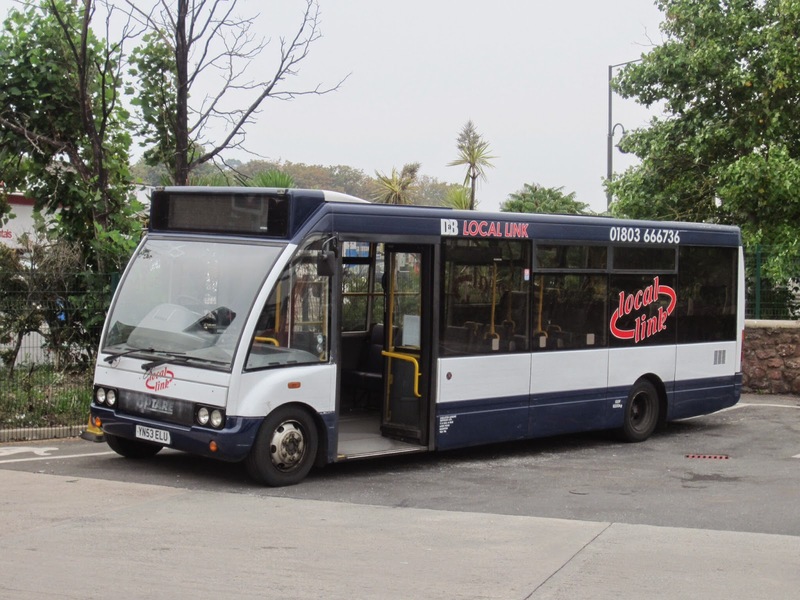 Final picture is that of Showbus veteran the former ECOC Bristol Lodekka JAH552D, now in Stagecoach livery and used for corporate use and private hires. Overall an enjoyable day was had, nice to meet up with plenty of old faces as well as meeting some new enthusiasts along the way and also fellow bloggers from the area. 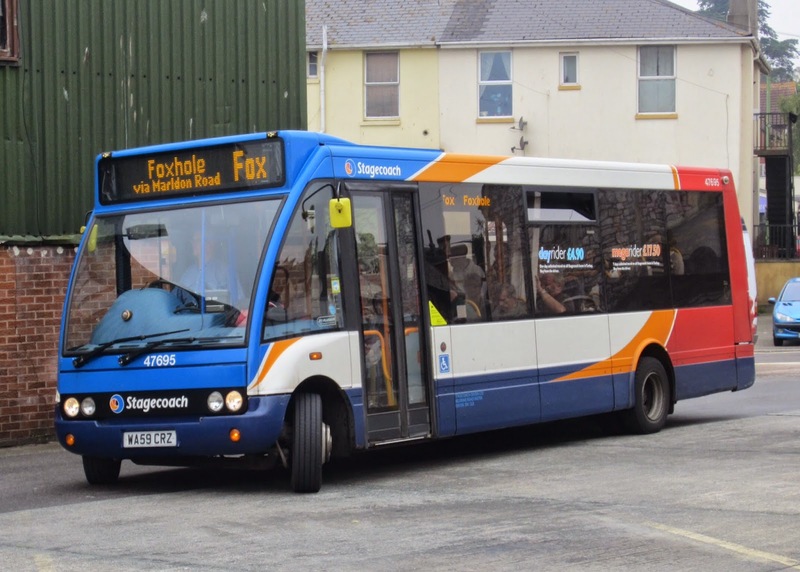 Many thanks to Chris Speed for inviting myself and Clive along on VA479 and well done to First for the turn out of vehicles from local Depots. 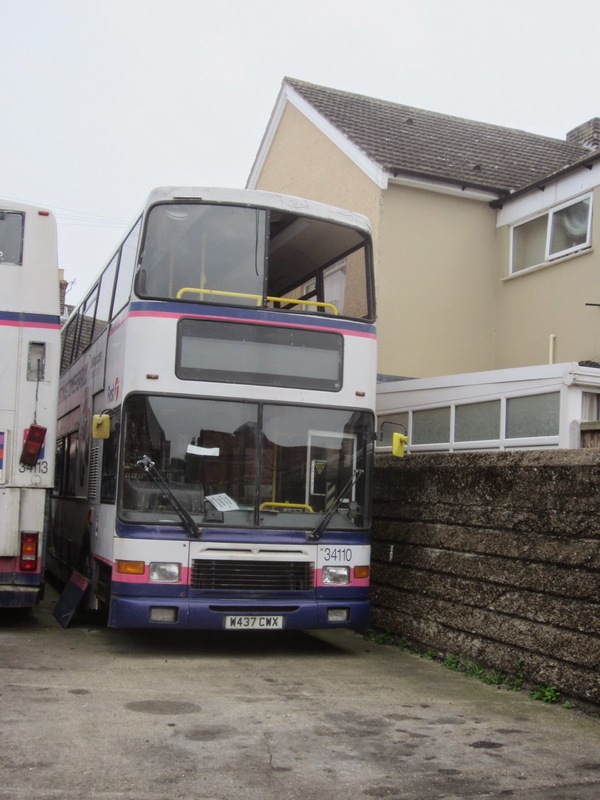 The coach is a 50 seater and was formerly registered M124UWY when new to Wallace Arnold way back in March 1995. 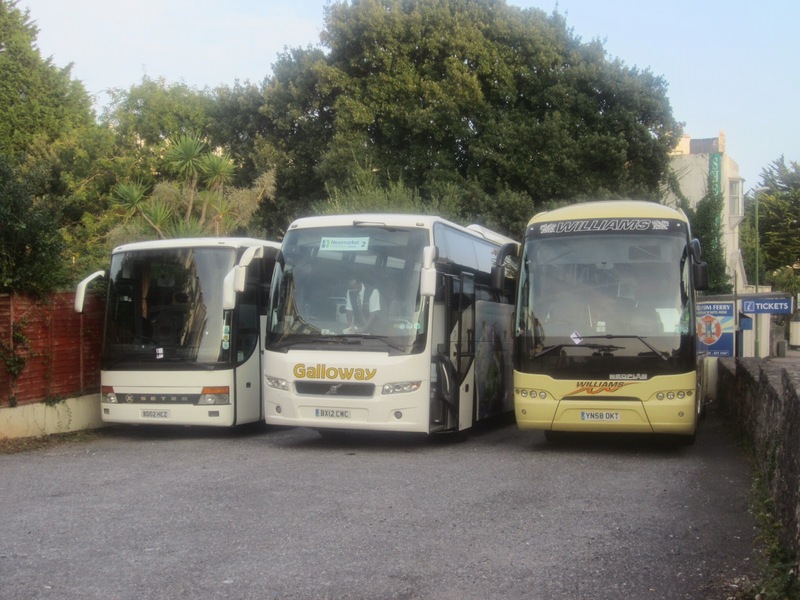 Joe Leathers-Watson observed the coach with its new owner at South Burlingham this morning returning to the depot. 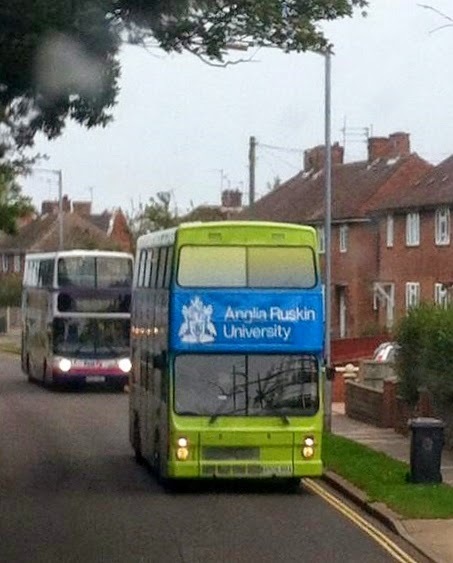 He informs me that that it only has the "Our Bus" logo on the front with the sides and rear remaining in plain white. Volvo Olympian/ Northern Counties Palantine 34158 P658UFB was transferred to First Potteries from Eastern Counties in August 2012. My thanks to Laine for the information. 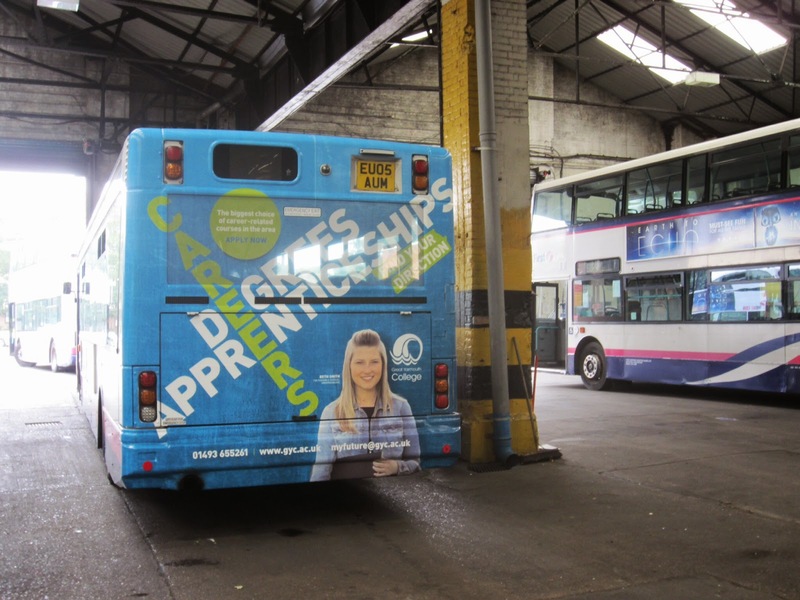 The decker, previously National Express West Midlands 2926, is travelling around the East of England visiting schools and colleges where it will be offering advice and guidance about Higher Education to pupils. Recent legislative changes now mean that schools and colleges are responsible for delivering information about careers and further study directly to their students, rather than using external careers advisors. 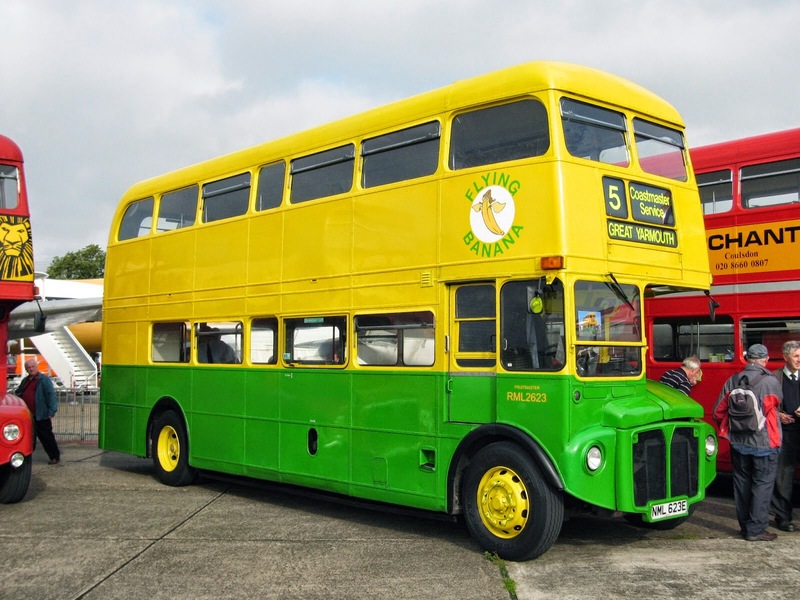 Well its that time of year again when all us "Anoraks" visit Duxford for the annual Showbus event, it returns to Cambridgeshire after a year away at Long Marston. 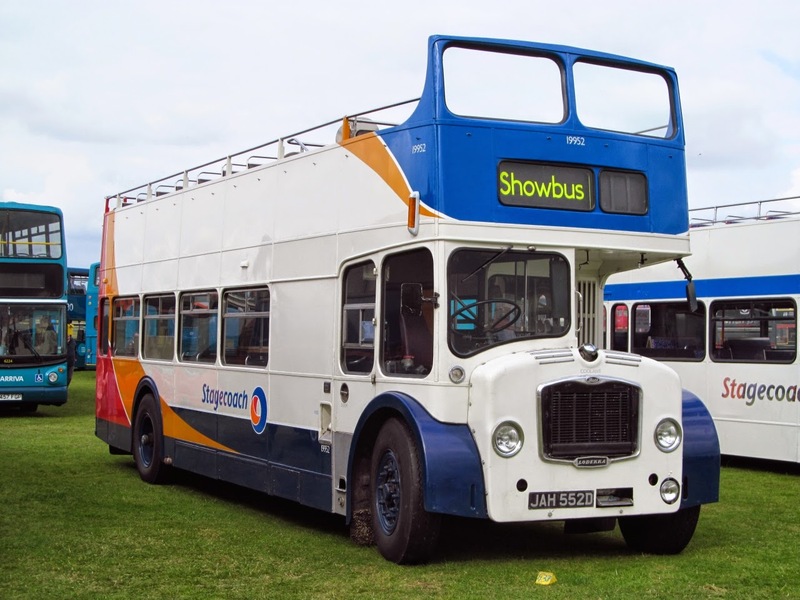 I decided to have a look back through my collection and share some photos from past Showbus events, as you will gather both Danny Beales and Chris Speed are good friends of mine and so i have been lucky enough to travel with First to the event on numerous occasions. 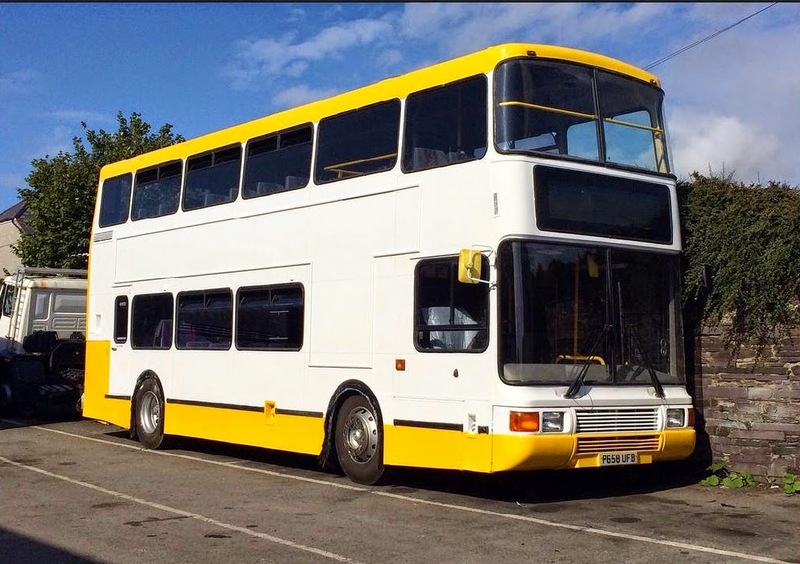 I think the first Showbus for me was 2001 and the entrant from Great Yarmouth was Dart G457KNG which wore the Blue & Yellow Blue Bus livery, driven by Des Speed. 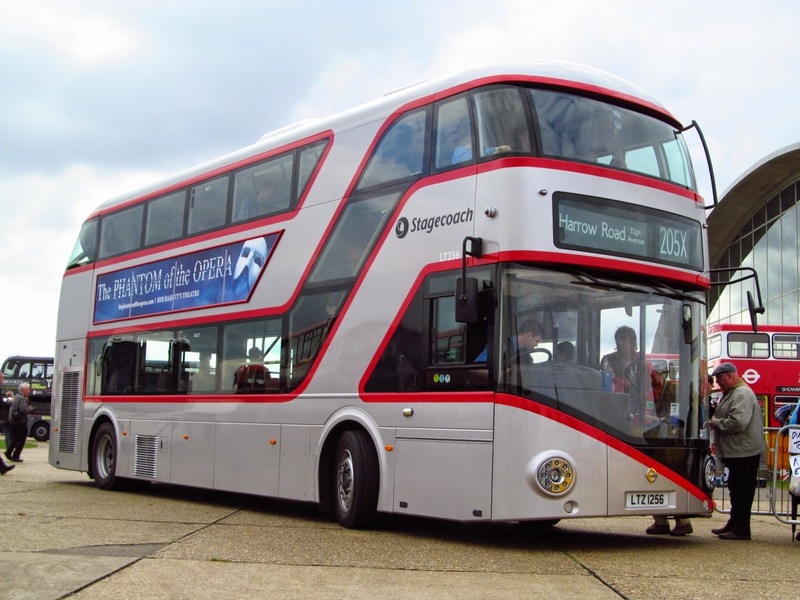 The following year saw the arrival of the fleet of Plaxton Paragon Coaches for the X94 and so 209 AO02RDU was chosen to be entered and myself and Chris spent the Saturday night at Caister Road cleaning and polishing her for the big day and we were rewarded by winning the award for Best Transbus/Plaxton vehicle at the show! 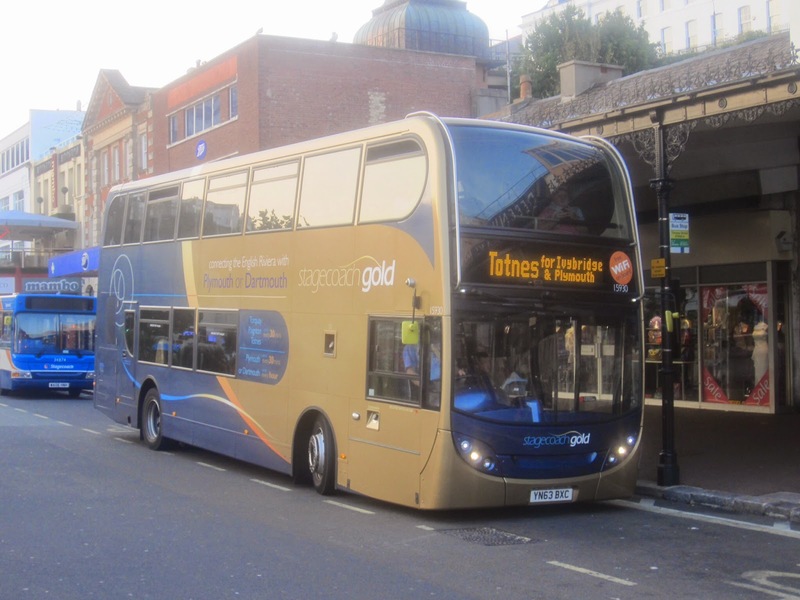 This year will see a mini invasion from First Eastern Counties with 3 Enviro 400's, 66957 in the new Ipswich livery and heritage liveried 32479 (my steed for the day!) 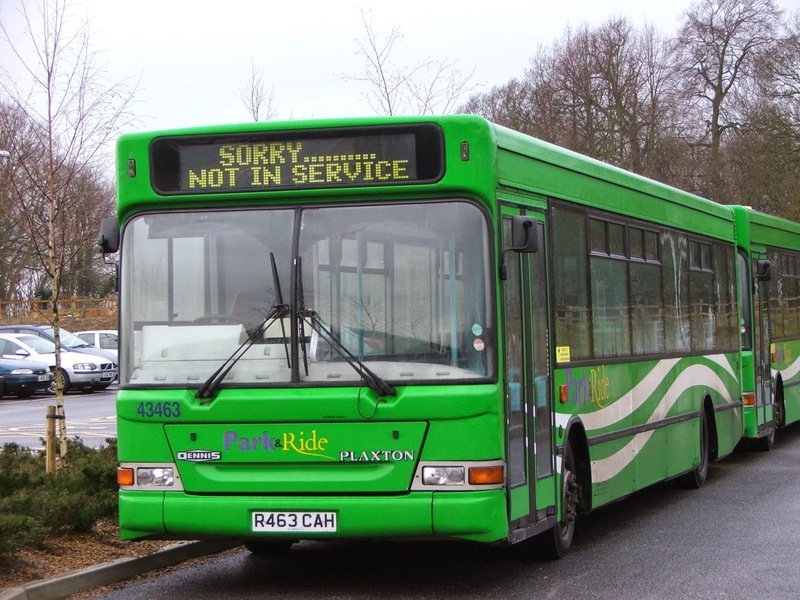 and a Norwich based vehicle is also expected. So here's to a good day out and fingers crossed the Duxford downpours stay away and the sun will shine on us all! I know Roy is unable to attend so i will be supplying a report on the days events in his absence and sharing the odd photo along the way so come and say hello, always nice to put faces to names. This years programme includes world leading crime authors and exhibitions, as well as talks and readings by special guests, including Agatha Christie’s grandson. 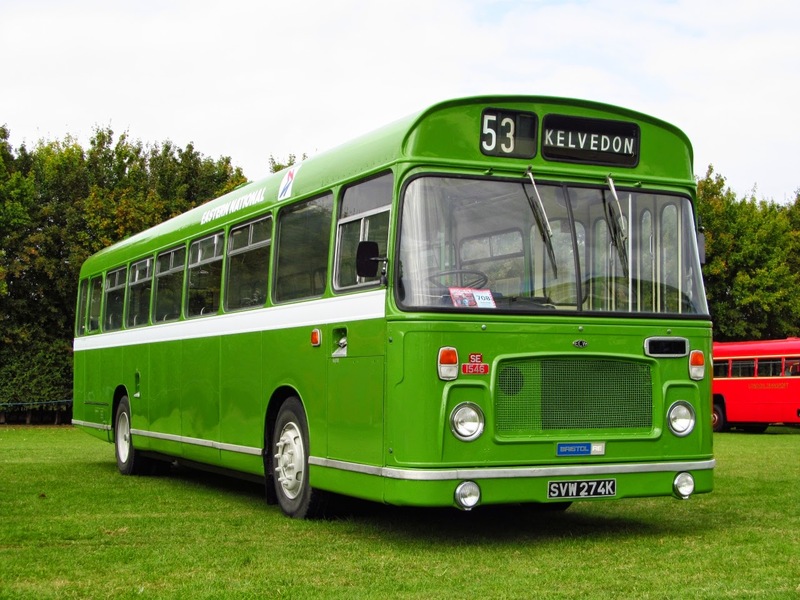 A full programme of events such as vintage bus rides, murder mystery dinners and visits to some of the places in the area which the author loved and which inspired her writing. 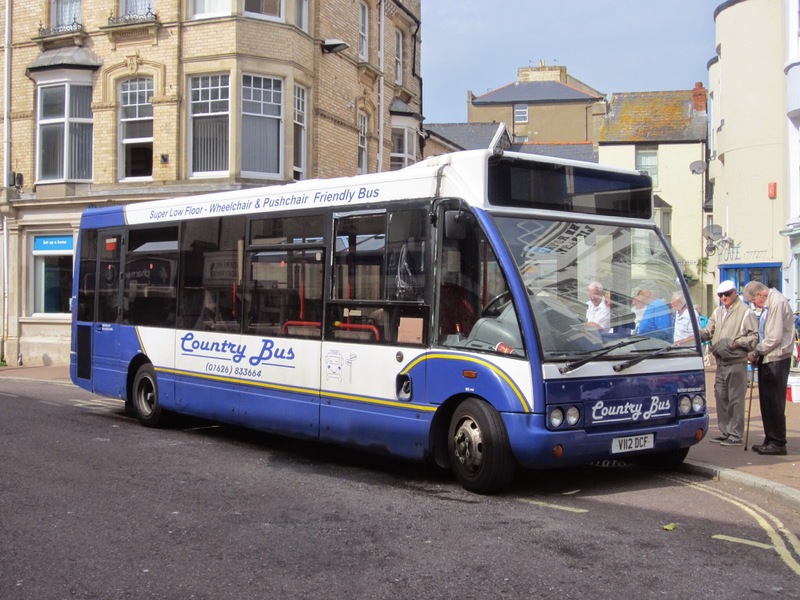 It was during the latter when I came across Devon's largest independent bus company Country Bus. 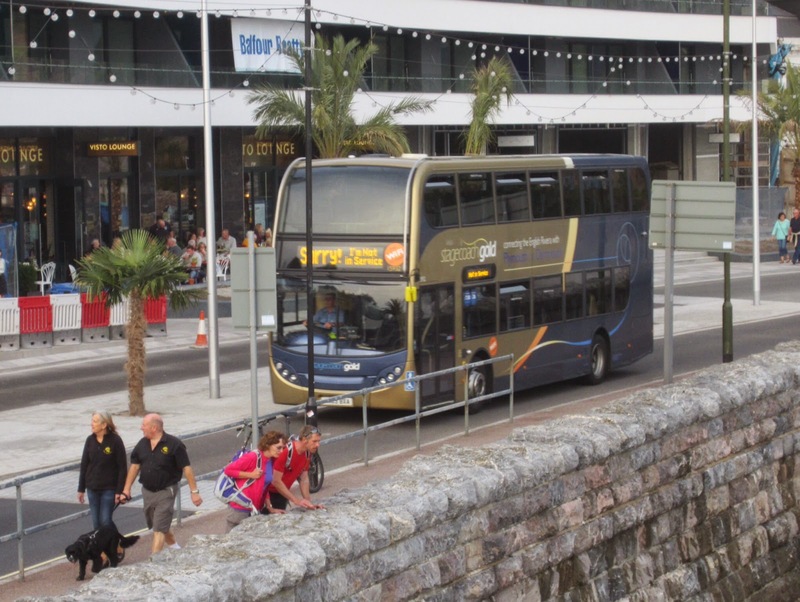 The majority of Country Bus services run out of Newton Abbot, although there are services based in Exeter, Teignmouth, Totnes and Brixham. 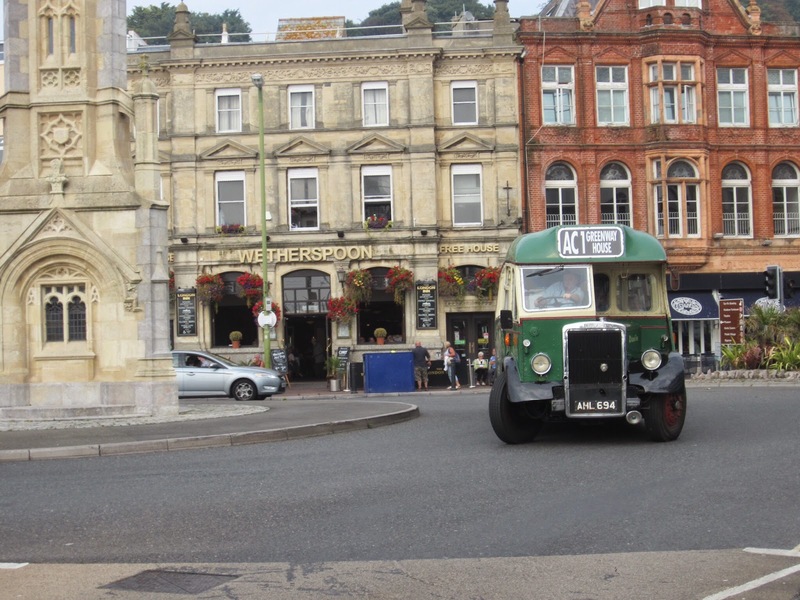 Yesterday I paid a visit to Paignton to take some pictures of the incoming Cathedrals Express hauled by steam locomotive Nunney Castle and to observe the local bus scene. 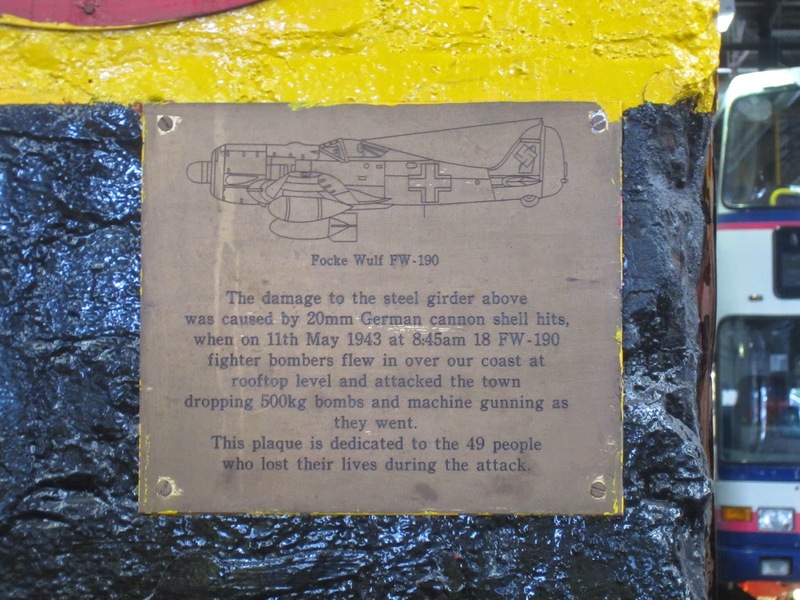 employed on the FOX service to Foxhole. 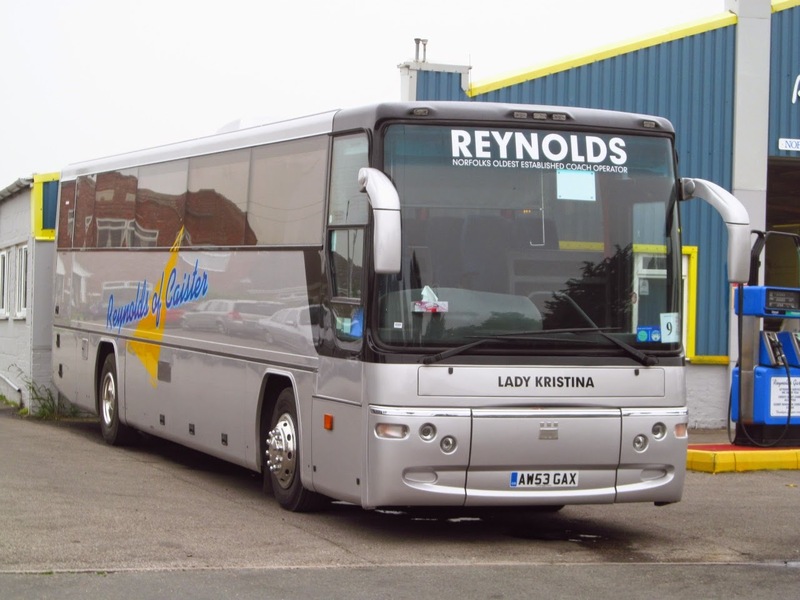 The Second Plaxton Profile aquired by Reynolds has had its lettering added and is now in service, AW53GAX is named Lady Kristina,noted this morning at the garage in Caister awaiting a school run. Sister AW53GAU is named Lady Jodie. 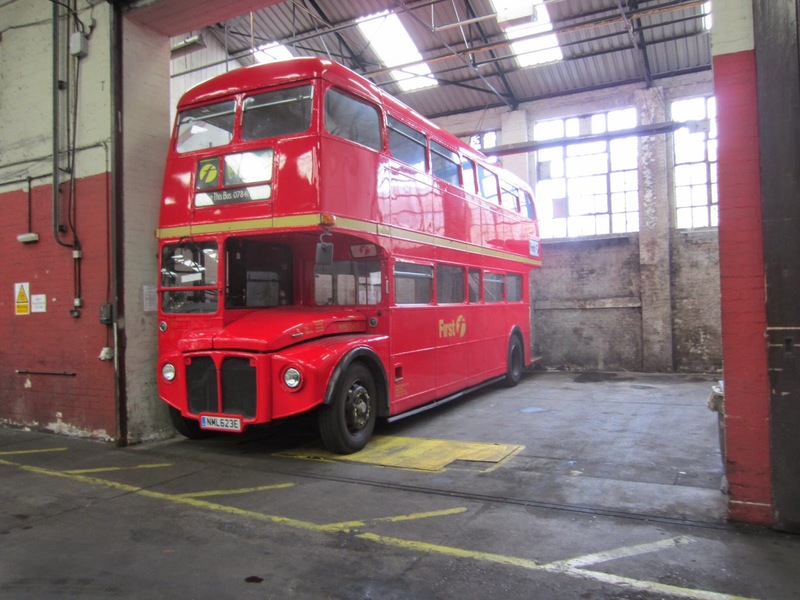 Other changes to note are that BIG9854 Lady Penny has had new light clusters fitted front and rear giving her a new look. Olympian 34110 out of use - what future does it have? Many thanks for the tour Danny and for showing us that there was plenty going on behind the scenes to enable First to keep the wheels turning. 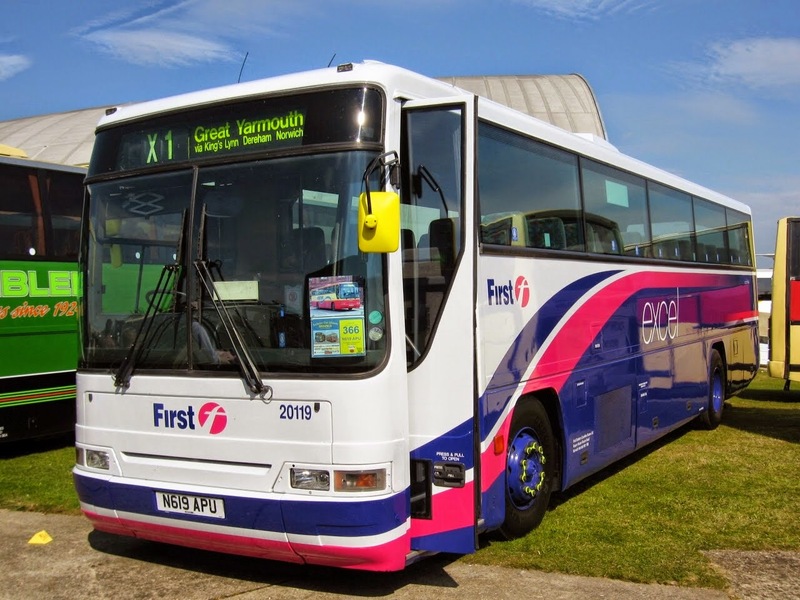 The first of two former X1 Geminis to regain the route branded livery will be 37578 AU58EDJ which will leave Caister Road tomorrow. 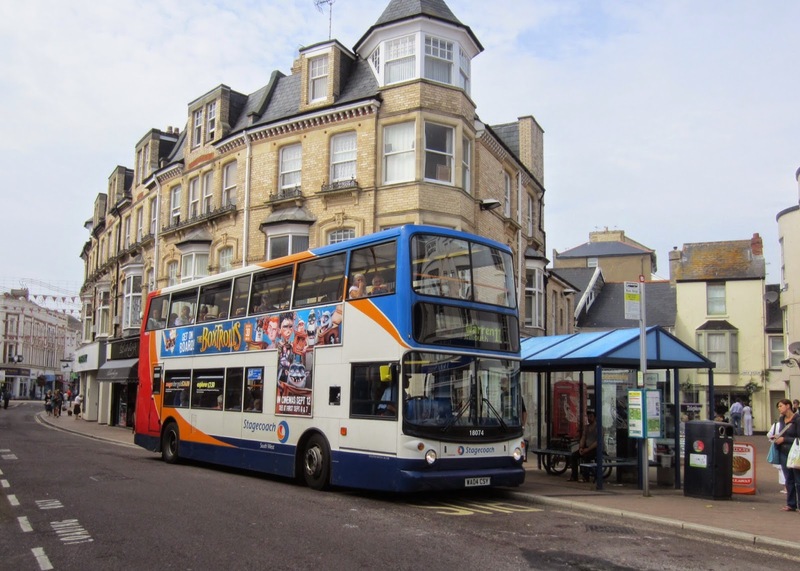 It will return in the Blue livery worn by the existing fleet of Enviro 400's on the route. Genini 37579 is expected to be the other with Enviro 33423 also due to be repainted . 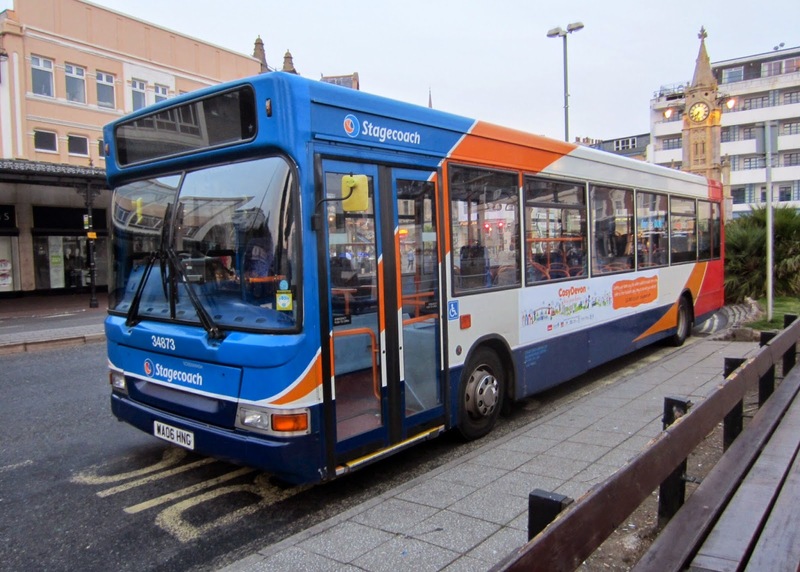 Surprisingly, at that time, there were a small number of Stagecoach South West buses hanging around for their next duty. A Galloway's coach provides the filling for the sandwich! 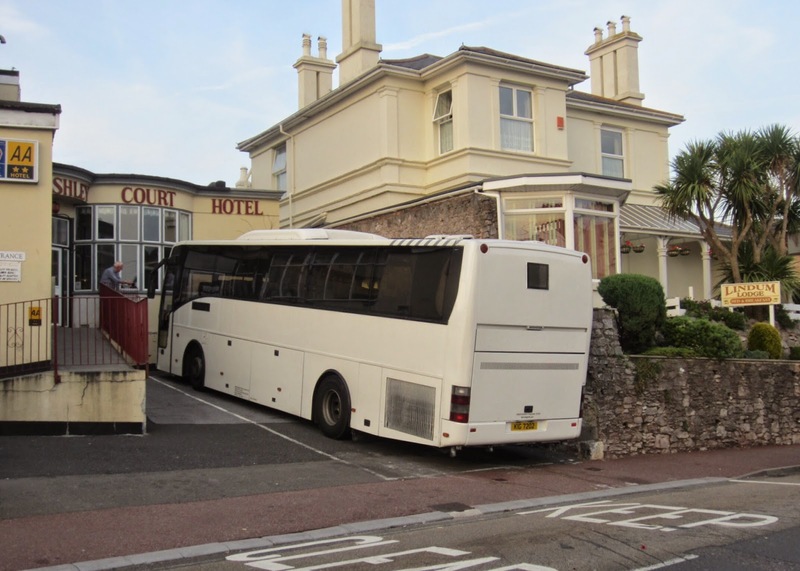 After a meal, we decided to work the calories off by walking around the yacht marina where another Stagecoach Devon bus was stationery opposite Debenhams awaiting its next duty. 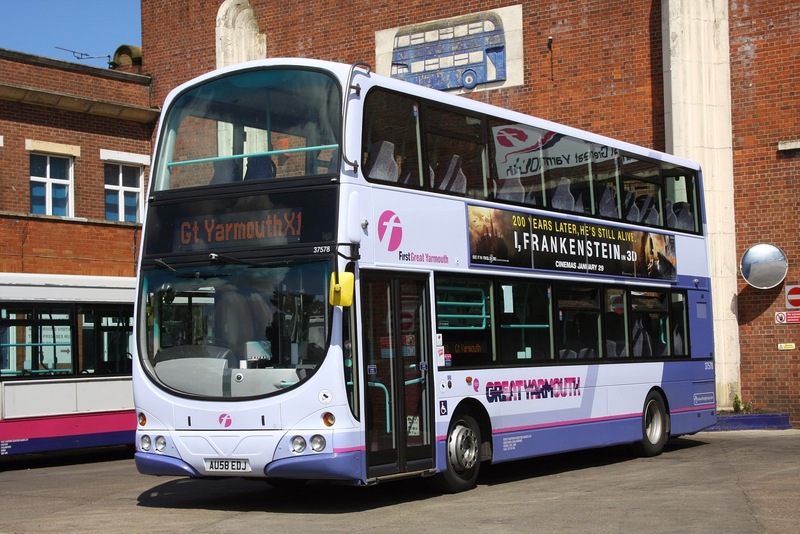 We can confirm that next weekend Volvo B7TL's 32201 & 32202 will move from Great Yarmouth to Norwich. 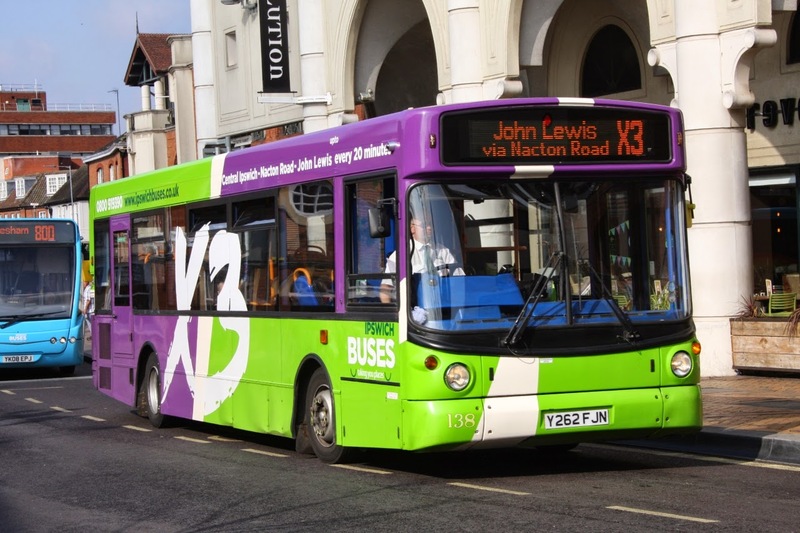 This is due to an increase in PVR for Norwich and also coincides with a drop in vehicles required for the 3 service in Yarmouth. 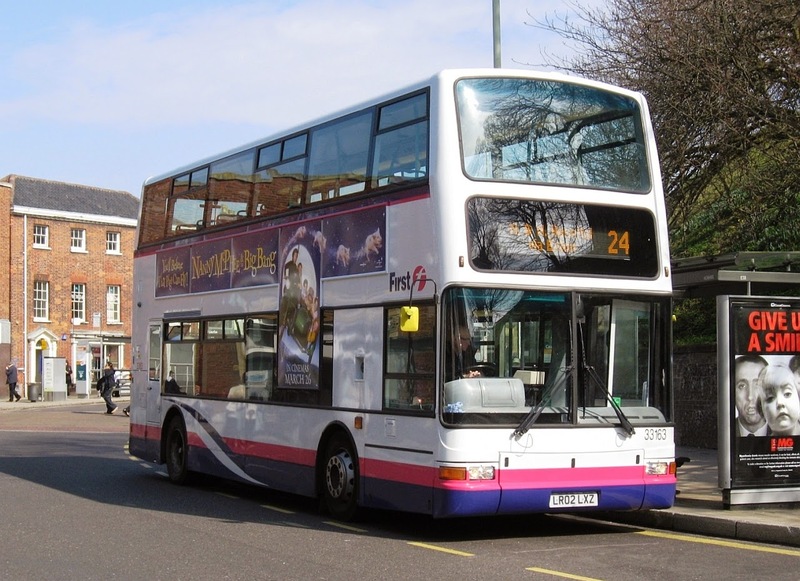 They will join 32200/32203 which moved to Norwich earlier this year. Thanks to First for the continued support and Information provided. A Trip with my children to Sheringham today meant i had to sneak the camera along just in case! 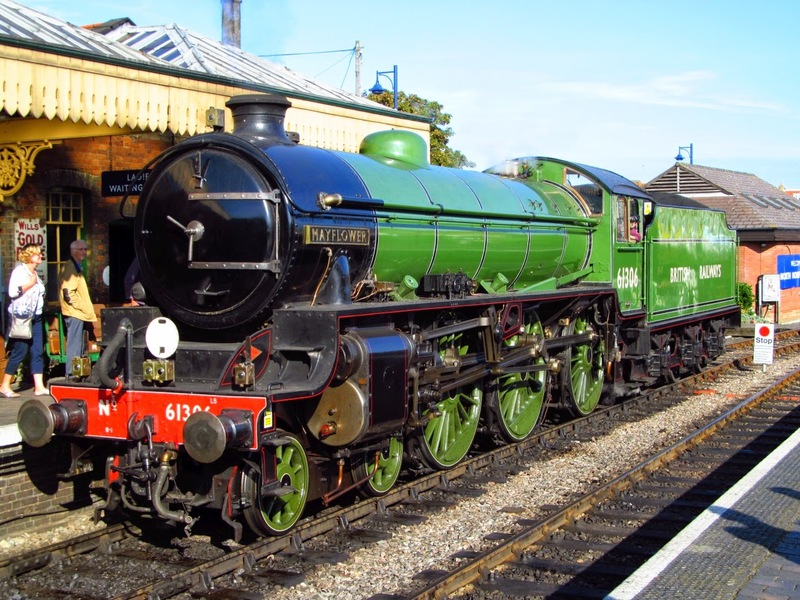 After a couple of hours at the Splash Swimming Pool we ventured into the town for a bite to eat and firstly stumbled upon British Railways Steam Loco "Mayflower" just arriving into the station and looking stunning in the September sunshine. 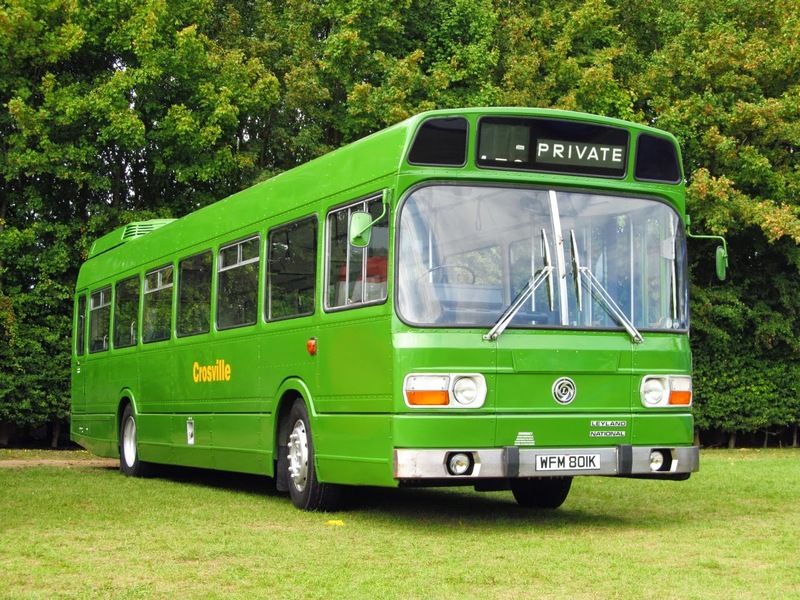 The local bus scene in North Norfolk is a three way operation with Sanders, Norfolk Green and Konectbus all running into the town, but today saw a few visiting coaches and a couple of more unusual types were noted. 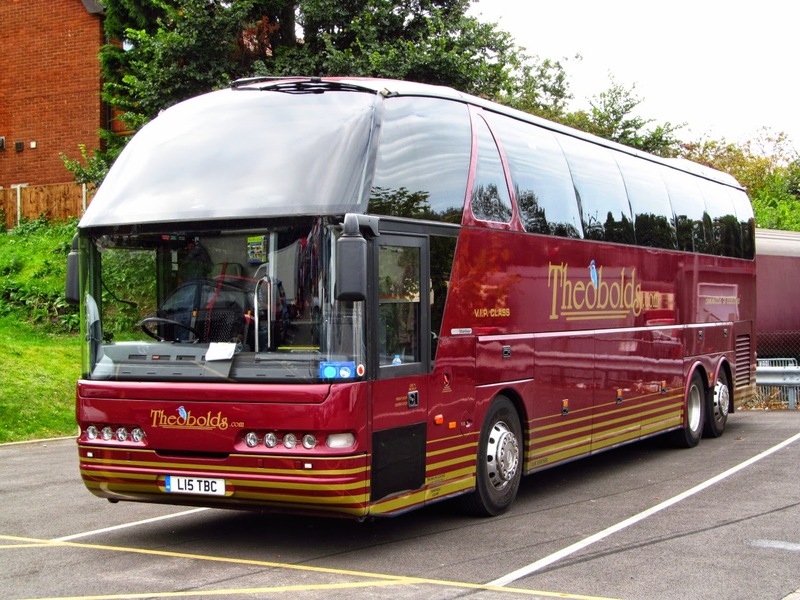 The first was Theobolds of Luton L15TBC (ex YN05AUU) , one of my personal favourites the Neoplan Starliner. 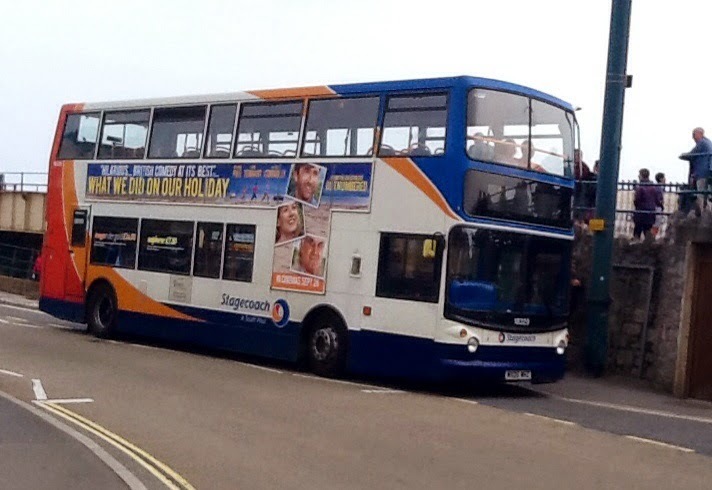 Another Starliner was also in the town in the shape of 6844WF belonging to Woods Coaches of Leicester. 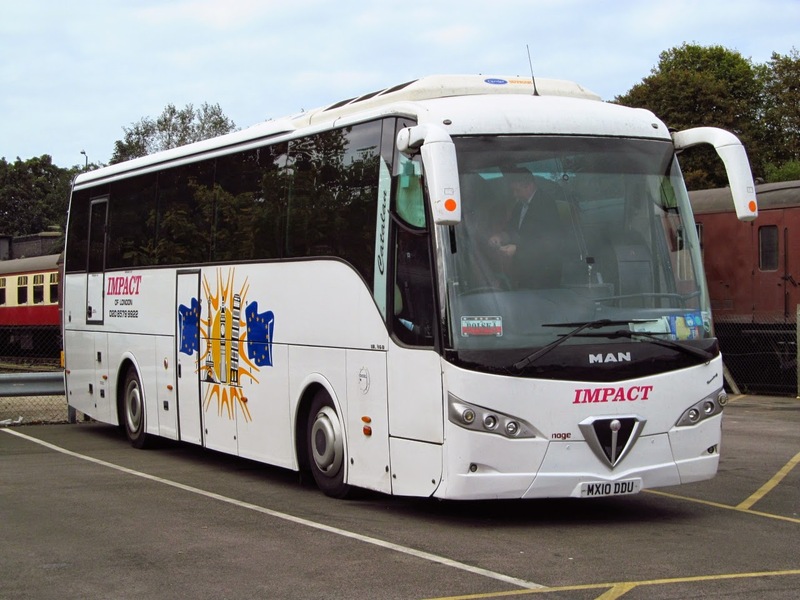 Another more unusual type noted was MAN, Noge bodied MX10DDU of Impact Coaches, London. 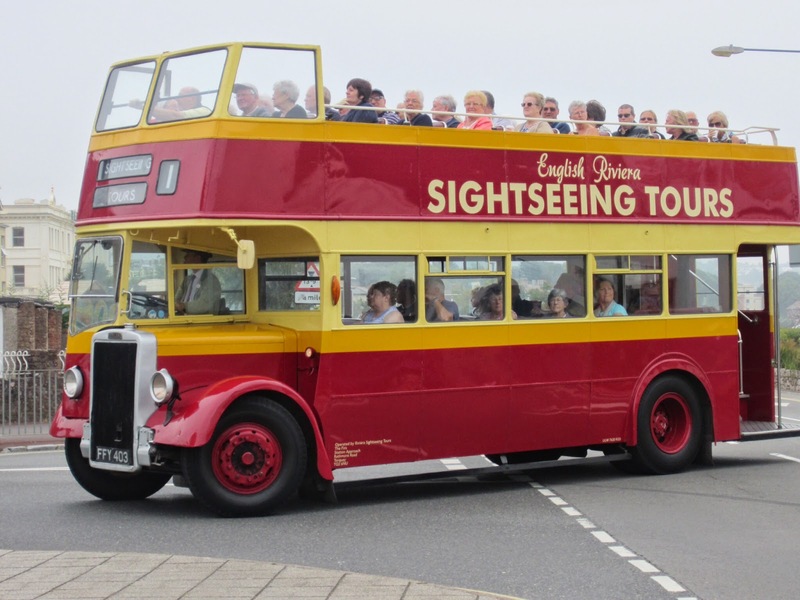 To be honest you cannot beat a day out in North Norfolk and for the transport enthusiast Sheringham certainly ticks all the right boxes! 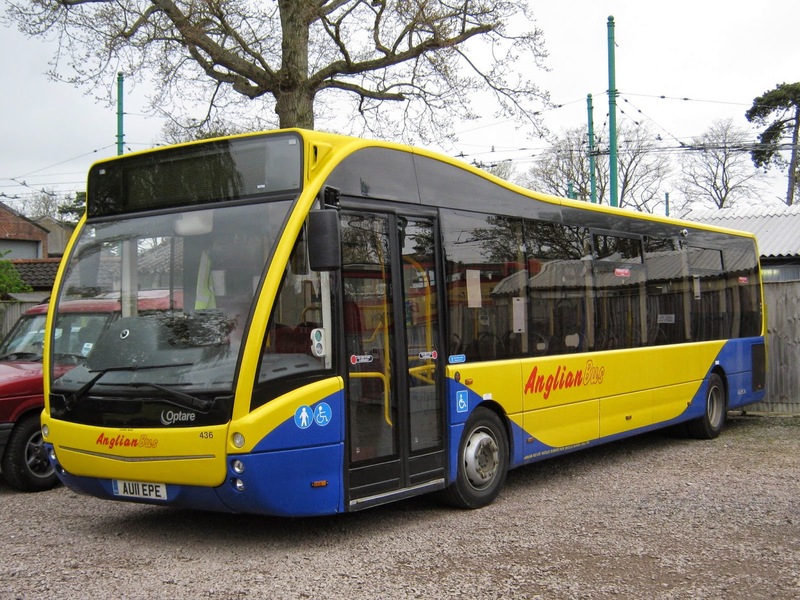 We can exclusively reveal that the first vehicle in Norwich to gain the new Norwich Network livery will be Plaxton President 33163. 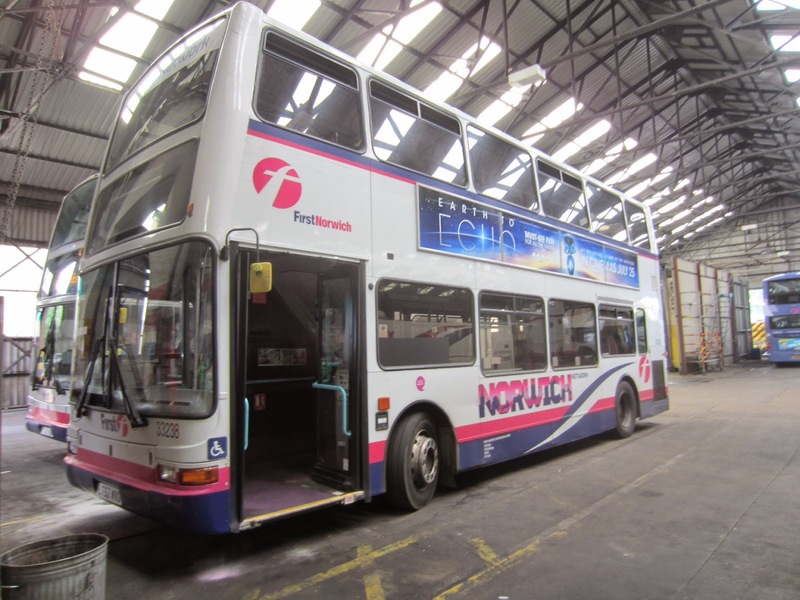 It left Norwich for Rotherham today and will return with new Purple Line branding which means a full purple front in similar style to the new livery being applied to the Ipswich fleet. 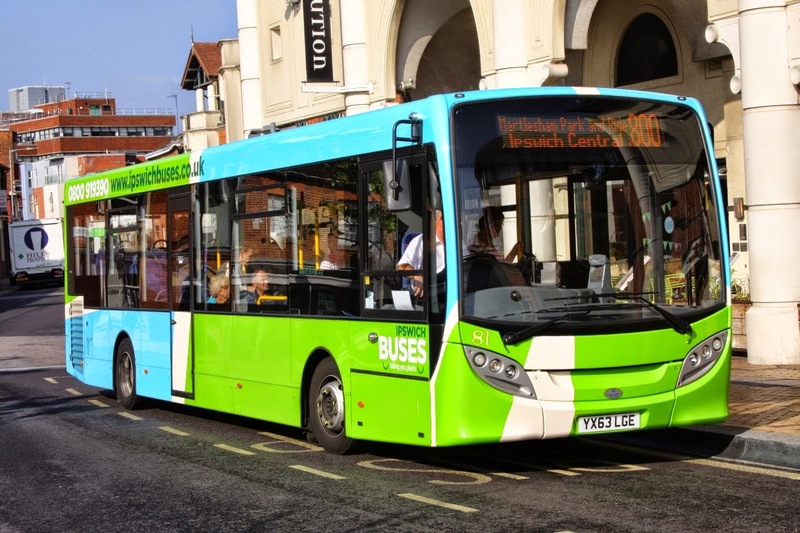 The Norwich Fleet will be repainted in the new style with vehicles gaining different colour fronts for the routes they operate although some will gain standard new livery for use on any route in the network.